Thought it was about time to post a thread on my progress, car is due out the paint shop with a new colour in next couple of days..
Then i fitted a UAS system with eibach shocks and manual management..
Paddle switches were put in the ash tray (have never seen this done before) i know why now as it was a nightmare! And single din swapped out for dual to house the viair gauges.. I had some bad luck with a faulty front bag and gauge leaking internally, Air Technic were amazing and sent me replacement parts straight out - I highly recommend them and their customer service and communication i will not hesitate to purchase all my components from them. So then had 2.25 inch chopped off the eiback shocks. At the same time i solved the problem of getting the front bag sitting central to the shock shaft. This was done be chamfering the lower bracket to match the lower perch (which i had already modified to clear the swagelock fitting). Then a top hat style teflon spacer pressed into the top bracket. This was how the car was sitting after the chop. Once this was complete i took it to a 4 wheel alignment centre do get the measurements from the system. Was starting to get inner wear on the rear as my normal ride hight (this is quite low by the way) They werent keen on adjusting suspension toe especially with my manual management so i just took the print out ant said ill do it myself! Out came the axel stands, tape measure and string and would you believe it i got near enough the exact same measurements as the digital system. Then came the tedious process of adjusting the rear toe to reduce my tyre wear. After an afternoon of adjustments and re-measuring i was happy id corrected as best i could. This was last spring by the way and has been ok ever since... Camber was matched both sides but im not running agressive camber as this is my daily driver. These were fitted and rolled ready for some new wheels. I picked up some staggered 3sdms at a price i couldn't resist this made sense as i couldnt decide on 3 piece wheels at the time. I ran with the nankang Ns2 last summer 215/40 on the 8.5s and 225/40 on the 9.5s, i was quite impressed and never had any issues.I then used them all winter on my other wheels and still a bit of life left in them..
NiklasStrom, Stanningtonglen and neil ratcliffe like this. As i seal yet more parts with CQuartz DLUX can i just say how impressed i am with this stuff, i did my wheels last year in/out and in the autumn when removed all the grime just wiped off leaving them looking like new. Last summer i eventually found the sportec bumper and skirts iv been looking at for years, correct me if im wrong but i believe this will be the only one in europe? Dont think anyone else is foolish enough to ship them over at the extortionate cost with shipping and import! With it taking months to get here there just wasnt enough time last year to get it fitted, i got bored so refurbished my winter wheels ready to take the 3sdms off the car. As time permitted i turned to the interior, I have a cream interior but with the hideous beige/brown dash and upper door trims. Swapped out the dash/steering wheel etc and I thought id be different with the door cards by making some black & cream ones. Then a couple of months ago thought it best to change all 4 doors due to rust appearing in obvious places, at this point i was just going to have the car the same colour and yet again found some good replacement parts the same colour, however due to age there was various dents and scrapes. Week before last was spent in the bodyshop stripping down and getting everything to fit how i wanted..
Stanningtonglen, Welshquattro, CHEZ and 1 other person like this. Thanks for sharing. Good hard graft! Nice work my friend very enjoyable read,cant wait for the final chapter. Wish I had some spare cash for mine now! Thanks for the comments - much appreciated. It has been a lot of hard work but feels rewarding as done most of it myself. Few pics from earlier in the week as it came out the spray booth. Now in Sepang blue pearl - So glad i decided on the colour change! Popped in the bodyshop yesterday to see how other parts were progressing and they all had basecoat..
Then after receiving a message with all parts ready i couldnt wait to go and progress. They had kindly hung the doors for me knowing i was on early shift, then i managed to fit door handles and most of the rear end. Just getting home as i write this! NiklasStrom, DrStrange, Adamwagg and 3 others like this. Did you just roll the lip or have you rolled the arches out to ?? Thanks im in live with the colour too, much better than the denim blue. Another day at the bodyshop and all frames fitted and few other bits... got issues with the the drivers door lower trim rubbing and had to shave some off and waiting for a repaint. Why do five minute jobs seem to take hours haha! I just rolled the lip back as far as the liners would allow. This worked fine with the genuine wings that were fully painted, but with these patent wings one of them didn't take to it too kindly and slightly distorted where than tab is. Good job this was pre-paint and rectified accordingly. Now 99% complete just need a new drivers door lower trim... very happy! bricktop138, NiklasStrom and Majic like this. love the new colour bud, looks like your committed to it, whats next on the cards? I know this is an old thread but just interested in seeing more! Is this car still about? It takes a brave (foolish?) person to weld a fully charged suspension damper. I have seen a bonnet strut ram explode from heat, and that’s not nearly as pressurised as a damper. 2013 B7 Seat Exeo ST Sport Tech | 2.0 TDI 170 | 6MT | Dakota Red Metallic | LED DRL’s | Bi-Xenons | LED Tails | LED RNS-E | AUX / iPod Input | Black Leather | Multi-Function Steering Wheel | Front & Rear PDC. 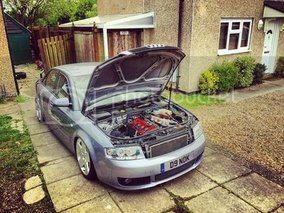 Audi V8 077-Series 32 / 40V V8 Guru.